McDonnell, Patrick. Shine! New York: Megan Tingley Books/Little, Brown and Company, 2017. “I wish I were…” Somewhere else. Someone else. Something else. 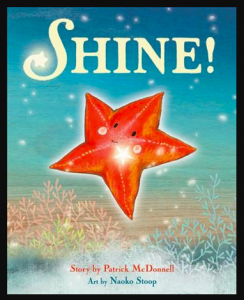 Little Hoshi wishes and wishes she were not a humble little sea star in the ocean. Until she learns, of course, that happiness is to be found right where we are and possibilities always surround us. This delightful picture book – illustrated by Naoko Stoop – is another heart-warming and inspiring story by the creator of the Mutts comic strips. 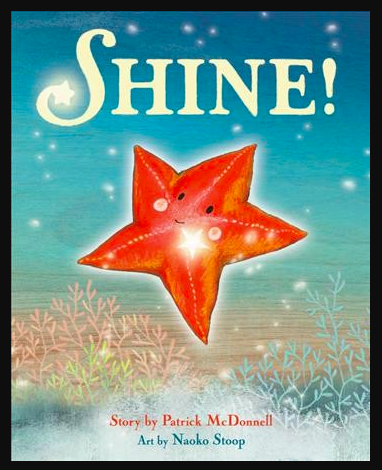 Highly recommended as a read-aloud – for listeners 4 years old and up – and for anyone who needs a humorous reminder that we all can shine. More stories about individuality HERE. More books about philosophy HERE.